There are basically two ways to look at the West playoffs every year. If the glass is half-full, we get mostly entertaining series from the NBA’s superior circuit, featuring star power and teams that are forced to earn their spots. Seeds two, three and four were determined by one game, and seeds five, six, seven and eight by two. No .500 teams are sneaking in. Then again, glass half-empty? Soap opera or not, the Warriors are probably coming out of this anyway. The Crossover previews the first-round matchups below. This time, there’s trouble in paradise, as the Warriors are marching toward a three-peat but certainly don’t seem to be enjoying themselves all that much. Attrition remains undefeated in the NBA, and Golden State’s most dangerous obstacle to another title lies internally. Granted, they’ve been through this before, and great teams figure things out when it matters, and there’s not really a reason to think the Warriors won’t do it. But Zapruder-ing their body language and trying to feel out where they’re really at begins with this series. The last time the Warriors didn’t appear in the Finals was in 2014, when, coincidentally, they lost to the Clippers. Don’t expect a miraculous, surprise result here, but this series offers an extended window into the state of the defending champions as the microscope intensifies. Let’s put it this way: if and when the Clippers are able to keep games close, someone is going to have to find a way to close them out. That someone is probably going to end up being Lou Will, for whom the Warriors lack an ideal defensive matchup (for what that’s worth). He will probably see a lot of Klay Thompson Williams specializes in creating something out of nothing, and that type of spontaneous offense may be what it’ll take for L.A. to steal a game or two and make this series interesting. The Clippers are scrappy, play connected basketball, and won’t be afraid of the moment. The Warriors are still the Warriors. Most Intriguing Storyline: Is Denver ready for the next step? Watching the Nuggets put things together from start to finish was enjoyable all season, and they return to the playoffs for the first time in six years. They play an attractive brand of basketball anchored by Nikola Jokic, the best frontcourt passer the NBA has seen in a long time, and who’s had the type of season that should at least earn him a place at the table with regard to present and future MVP conversations. Denver surrounds him with quality young talent, headlined by Jamal Murray, and a breadth of capable shooters. However, the Nuggets can’t boast much playoff experience beyond Paul Millsap, and, naturally, they face a perennially successful Spurs franchise that can budget for its annual postseason travel in advance. 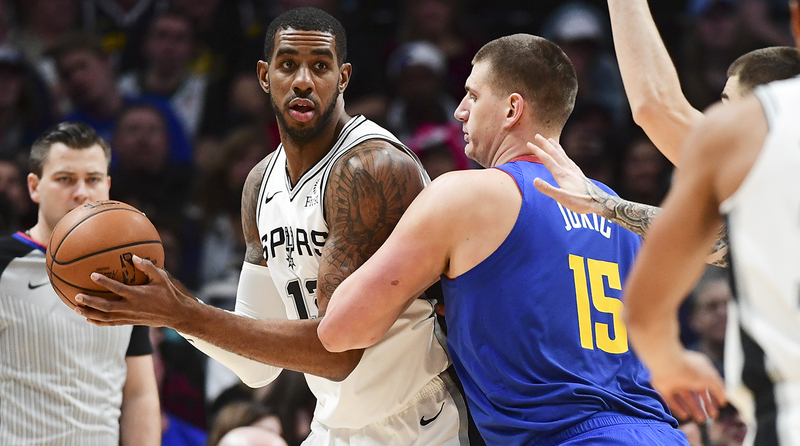 While the matchup itself is favorable—San Antonio likes to play multiple bigs and won’t be scheming Jokic (and his lumbering defense) off the court—winning their first playoff series may involve taking some lumps first. It’ll be curious to see whether a change of scenery can help DeRozan exorcise the demons of playoffs past. In 51 career postseason games over the last five years, all with the Raptors, he’s been a 41% shooter from the floor (he scored at a 48.1% clip this season). Based on his volume of shots, DeRozan’s counting stats tend to be there in the end, but now that he’s reverted to hardly ever shooting three-pointers, attempting just 45 of them in his first year with the Spurs, it could be that his style of play is even more predictable this time around. DeRozan (who in his defense, also averaged a career-high 6.2 assists this season) and LaMarcus Aldridge (who also has playoff woes in his ledger) are San Antonio’s two offensive constants; take one focal point away and their army of role players is much easier to to handle. If the Spurs are going to flip the upset here, they’ll need more from their leading scorer. The Pick: Nuggets in six. Denver’s depth allows them to win the matchup battles, while Jokic continues his ascent and ultimately swings the series. This series pits two teams with a history of not liking one another very much, beginning with their star point guards, who have verbally sparred on many an occasion. All of that lends itself to games that are frequently tight, competitive and physical, and while the Thunder actually swept the Blazers in four regular-season meetings, all of those games were close. Now, there’s even more on the line. Granted, notable instigator Jusuf Nurkic will miss the playoffs recovering from injury. But the Westbrook/Lillard battles offer plenty to unpack, pitting two of the league’s most prolific backcourt players, both of whom love big moments, against each other in a high-stakes setting. The Blazers have hit a continuum with Terry Stotts and their personnel, while the Thunder have yet to win a playoff series without Kevin Durant, and have more to prove. These teams, and their stars, are desperate to get out of the first round. Only one can go on. Admittedly, it’s rather obvious to label Paul George as an important factor in a playoff series, but it has to be noted that he absolutely torched Portland all season, averaging 38 points, 10 rebounds and 8.8 assists in the four games. The Blazers don’t have a great answer for him defensively, and conversely, George is big and quick enough to bother Lillard and C.J. McCollum when the situation calls for it. If Portland can’t find a way to slow him down, their home-court advantage may not matter. To a greater extent, George is the key to the Thunder’s general playoff hopes, particularly after OKC closed the season poorly. He probably didn’t get enough credit for his huge year, and that can change if his team mounts a run here. Being on the non-Warriors side of the bracket leaves opportunity for everyone. The Pick: Thunder in seven. This should be a captivating series that goes down to the wire, and if there’s a nominal first-round upset in waiting, it’s this one. Most Intriguing Storyline: Offense or Defense? Stylistically, there’s no first-round clash more stark than these two teams, who met in last year’s West semifinals, with Houston winning in five games. Led by reigning MVP James Harden, the Rockets want to blitz opponents quickly, score as many points as possible, and open up the floor. The Jazz are anchored by the league’s most consistently game-changing interior defender, Rudy Gobert, and will try to wall off the paint and make their opponents take uncomfortable shots. 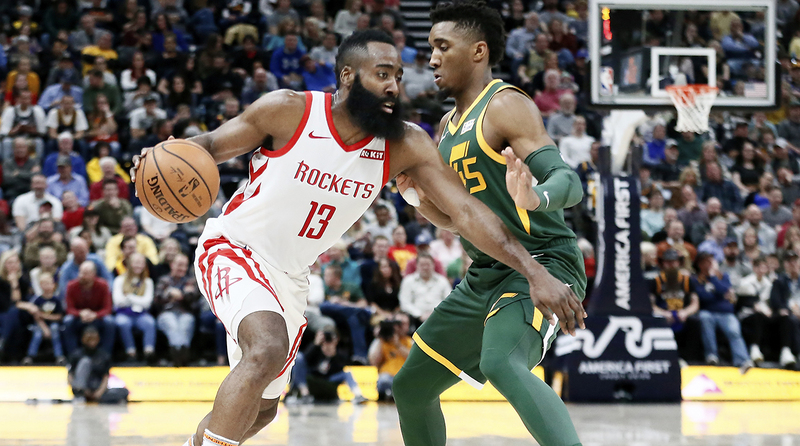 Utah had some success slowing Harden and Houston this season (and they split the season series), but the Rockets began peaking in the middle of the season and are a well-oiled machine once again. The backcourt battle here also includes the always-cranky, still-effective Chris Paul, and motivated young Jazz star Donovan Mitchell, who caught fire individually in last year’s series. There will be some ebb-and-flow to this, and whoever imposes their style better should have the edge. This edition of the Rockets is inarguably thinner when it comes to their supporting cast, after cycling through a variety of options and settling on Austin Rivers, Iman Shumpert, Danuel House and Kenneth Faried as supporting options. That group is not the banner of consistency, placing additional onus on Tucker, who started all 82 games this season and has proven himself to be a key glue guy. He was red-hot shooting the ball from outside in last year’s playoffs (46.7 percent! ), and will need to remain opportunistic and space the floor effectively in this series. The Jazz have an array of bigger, longer forwards he’ll be matched up with, and will try and grind games to a halt. Tucker can be a tone-setter with his toughness, but needs to continue giving Houston more than that. The Pick: Rockets in six. Harden and a healthy Paul will be enough to earn the Rockets the second-round rematch with the Warriors they badly desire.